California’s water future is at a critical juncture. The Sacramento-San Joaquin Delta is declining, both as a reliable hub for exporting water for millions of Californians and millions of farmed acres, and as an ecosystem supporting a vast array of wildlife. The Delta Reform Act of 2009 set a fundamentally new state water policy by mandating the “coequal goals” of water supply reliability and ecological restoration of the estuary where native fish populations are crashing. To meet those goals, the state has proposed construction of two giant water export tunnels underneath the Delta, running 35 miles from new intakes upstream on the Sacramento River to existing export canals near Tracy. The re-plumbing proposal in the Bay Delta Conservation Plan is highly controversial and expensive. But the costs of inaction are better understood today than they were in 1982 when California voters first rejected the proposed Peripheral Canal. Hard decisions will have to be made. Does California have the will to do it? 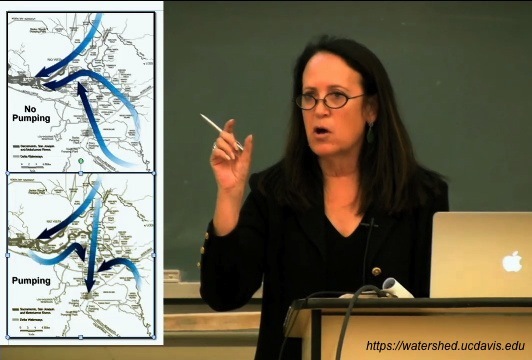 This past winter, the UC Davis Center for Watershed Sciences, publisher of CaliforniaWaterBlog, invited nine top water leaders to share their insights on this question and others. The speakers were mostly optimistic, although each saw the path forward somewhat differently. Phil Isenberg, chairman of the Delta Stewardship Council, said his hope springs in part from water contractors’ newfound acceptance of uncertainty in amount of Delta water exports. The debate over the Bay Delta Conservation Plan marks the first time the contractors have not demanded legal guarantees on how much water they would received, Isenberg said. Felicia Marcus, a member of the State Water Resources Control Board, sees hope for compromise because “virtually all” Delta interest groups are backing off from their “all-or-nothing” positions of the past. State Natural Resources Secretary John Laird talked about developing solutions within the existing legal framework. He sees this time as a window of opportunity for reform that isn’t opened but every 10 or 15 years. One of the biggest challenges he said is public perception, particularly among older Californians. 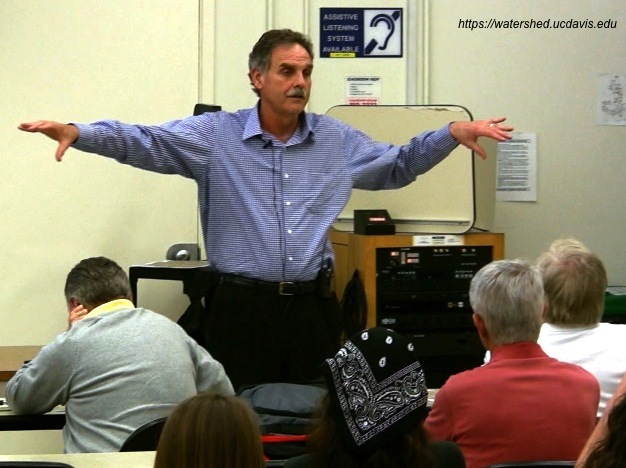 Tim Quinn, executive director of the Association of California Water Agencies, said the new coequal goals are achievable through technology but much more expensive than the traditional single-purpose goal of expanding the availability of cheap water. Department of Water Resources Director Mark Cowin said that while the department has made headway integrating flood management, water project financing and land use planning with traditional water supply-and-demand issues, new and better water management tools are needed. State Sen. Lois Wolk of Davis said that while broadening the representation and collaboration in water policymaking is more difficult and time consuming, the outcome is more sustainable because it enjoys wider support. Jay Lund, director of the watershed sciences center, pointed out that local governments and irrigation districts are the key to moving the state towards solutions in this era of declining state and federal capacity to fund and manage water projects. 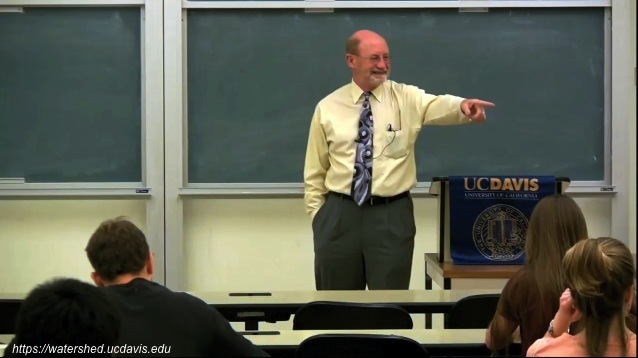 UC Davis’ Peter Moyle shared his history studying the delta smelt, his outlook on the fate of California freshwater fish and his prescription for conservation of aquatic species. 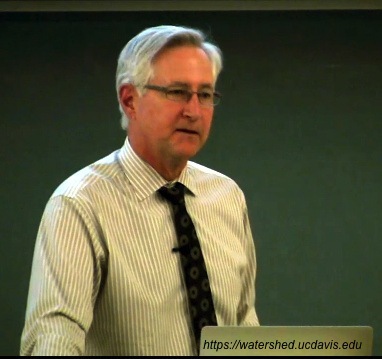 Tim Washburn, planning director of the Sacramento Area Flood Control Agency, gave a lively presentation on the 160-year history of the Sacramento area flood control system, up to the adoption of the Central Valley Flood Protection Plan, in 2012. This entry was posted in Uncategorized and tagged California water, Chris Austin, Delta, water policy. Bookmark the permalink.